a commercial chess program developed by Chris Whittington in the mid 90s as successor of the Complete Chess System, marketed through his company Oxford Softworks. The first version was a MS-DOS program, Chess System Tal II, released in 1999 ran under Windows. Chess System Tal is famous for its entertaining, strong human playing style with focus on King attacks and speculative sacrifices, resembling that of the former World Champion Mikhail Tal. Chess System Tal II was further marketed by Ubisoft  and continued by Jeff Rollason's AI Factory  , who now own the rights on the CSTal sources . 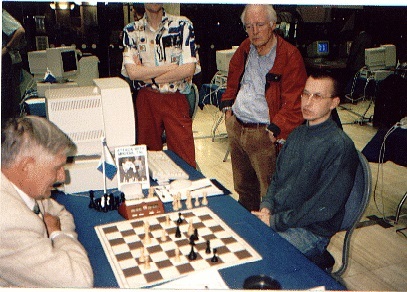 CSTal played two World Microcomputer Chess Championships, the WMCCC 1995, the WMCCC 1997, and three Aegon Tournaments, Aegon 1995, Aegon 1996 and Aegon 1997 . CSTal is designed to play in the romantic and dangerous style of Michael Tal, famous for his daring and aggressive style of play. Programmer Chris Whittington has developed a radically different approach to chess programming, concentrating on speculative chess knowledge within the evaluation function; and the use of forward pruning techniques which rely on this evaluation function knowledge. One effect of using a high knowledge-based approach is that CSTal operates at a nodes per second rate much less than programs with simple evaluation functions. The risks and benefits of this strategy are obvious; on the one side CSTal is able to steer games towards tactical king-attack complexities, and to execute stunning sacrifices. On the other side the disparity in effective search depth means that state of the art search programs will have the advantage if the position does not contain factors where CSTal's knowledge is able to give it the edge. CSTal's computer-computer games are often very exciting and double-edged, with the result in doubt until the end. It is capable of causing serious upsets to top programs, but also of being seriously upset itself. In a materialistic world, in the materialistic world of computer chess, Chess System Tal offers the alternative pathway of idealism.